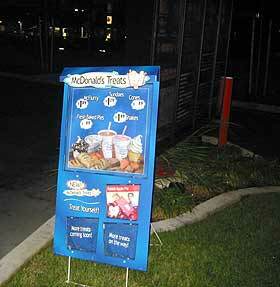 At the end of 2001, the McDonald's restaurant nearest my house set up a new "desserts" menu board in the drive-thru. 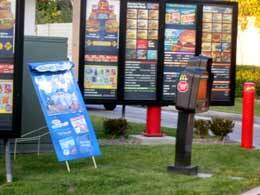 It was a small, unlit menu board, highlighting their dessert choices. 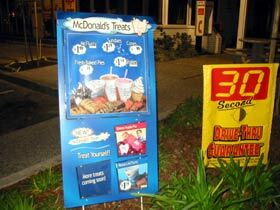 There were three slots for item placards, but only one of them was occupied, advertising the Reese's McFlurry. 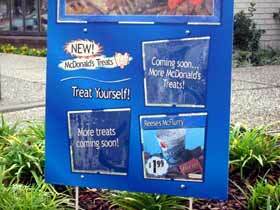 The other two slots lay empty, promising "Coming Soon... More McDonald's Treats!" and "More treats coming soon!". It was time to make some more treats. Giggling to myself as I dreamed up new dessert items, I imagined hundreds of cars driving by my newly-added items, laughing. 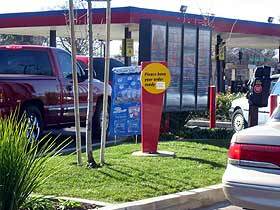 Unfortunately some wiseacre or dimwit would eventually ORDER the "McSalt lick", "Vanilla Swirlee" or the "Chocolate McStarfish". This would alert the restaurant staff to the problem and my hard work would end up right in the garbage can. While I was still struggling with this problem, I snuck down one night and measured the quadrangular slot so that I could create perfect-sized item placards. There, as I turned to walk home, lay my answer! 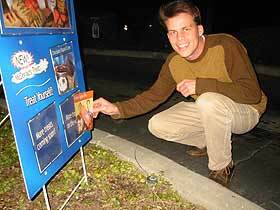 On the side of Blockbuster video lay a giant promotional display for American Pie 2. I would make a new dessert card for McDonald's Apple Pie, but would carefully integrate an image of Jason Biggs. 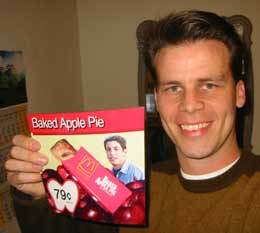 Jason played the role of Jim Levenstein in the movie, well known for loving apple pie. It was perfect! I rushed to take advantage of the timing of the AP2 DVD release. I wanted it to look like a poorly-conceived movie-tie in. A few days later, I began assembling graphics for the new treat. First I got a photo of the Reese's McFlurry so that I could copy its layout. 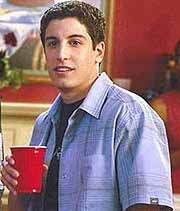 Next, I scoured the internet looking for photos of Jason Biggs. Third, I bought & photographed some photogenic apples. Finally, I bought a genuine McDonald's baked apple pie and photographed that. I carefully put all the pieces together in Photoshop. It looked magnificent! 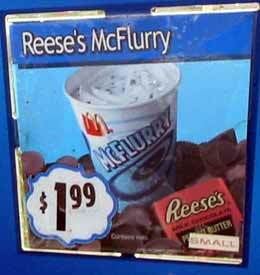 Note the design features of the Reeses McFlurry sign placard: The title bar at the top (with drop shadow), the top-down product shot in a sea of peanut-butter cups, the black price in a white-on-blue swirl. I designed my sign with these same features. 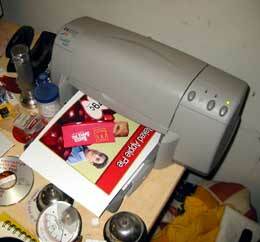 I printed one out on super-fine glossy paper & laminated it for that professional sheen. Here I am with the new apple pie sign. Jason B. is peeping out over the apples. He loves them pies! Counter to my normal operating procedure, I struck late that night, slipping my new treat placard into one of the treat slots. Mission accomplished! I took a quick photo and disappeared into the night. The next day I was confident that the apple pie advert would still be in place. Iindeed it was. 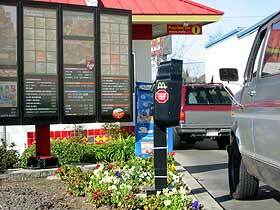 There were cars lined up at the drive-thru...lots of cars. I wondered...how many of them got the joke? 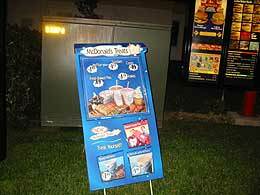 That night I visited 7 more McDonald's Restaurants, and four of them had dessert menus. By 2am, they were all benefiting from the celebrity endorsement of Jason Biggs.. apple pie lover. I figured that McDonald restaurants all over the country would have these same blue desert menus, so I printed and laminated 18 more apple-pie signs and sent them to some friends around the United States and Canada. At the end of January, I sent one each to Mark, Rebecca, Christina, Holly, Ada, Katie, Elliot, James, Morgan, Brandi, Larry, Evan, Matt, Michael, Josh, Steve, Ben and Tim. 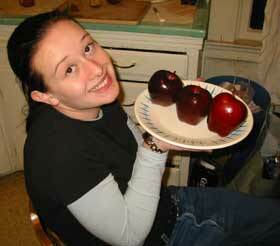 I also emailed the apple pie .PDF file out to Walter. 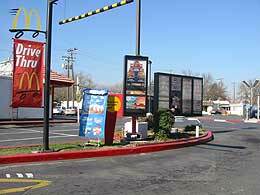 I didn't send any to New York or San Francisco because I know how rare drive-thrus are in pedestrian cities. 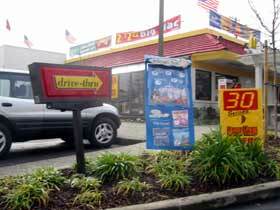 At the double drive-thru on Madison Ave. near San Juan. At Madison and Sunrise Blvd. About 3 weeks later, Ben Clark wrote and said he couldn't find one in Oregon. I began to fear the worst. 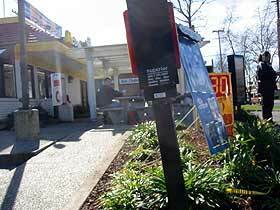 Alas, McDonald's marketing was a little less predictable than I had assumed. 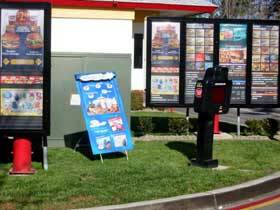 Word quickly got back to me that the blue dessert menus were difficult to track down outside Sacramento. 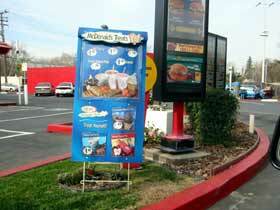 Rebecca Paiva of Massachusetts hoped a "New Tastes Menu" would suffice, and the placard fit! She sent photos and a detailed story. Raising the bail money should be no problem, right? The sign closest to my house remained up for months. Through February, March, and April. The lawn it was on had sprinklers. That had the unfortunate effect of filling the plastic pocket with moisture, which eventually resulted in black patches of mold growing over the placard. On May 3rd, I noticed it had finally been removed. 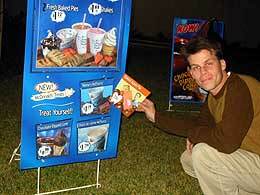 Summer's almost here, so I've been thinking about replacing it with a new item... how about the the "Hershey McSquirt"?